Just your typical farming script since I didnt see one for Icecrown uploaded. The path is in the uploaded! Hope you guys enjoy! I reccomend using the plugin "SmoothMove", It's super useful! 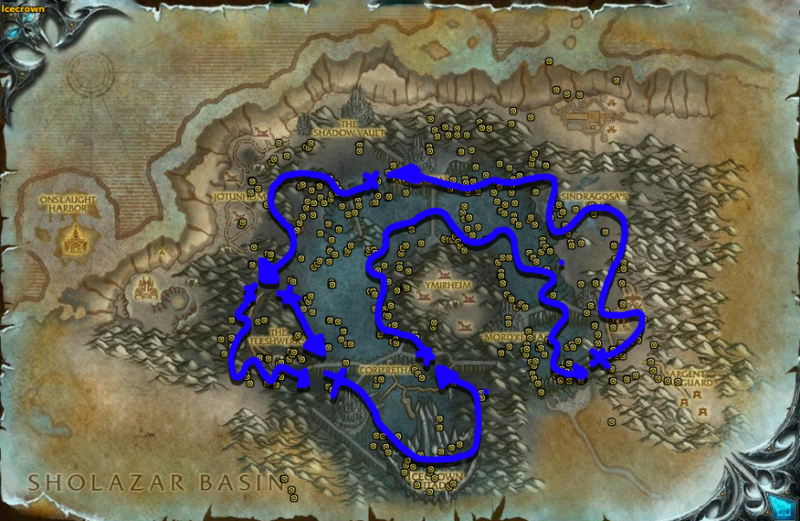 I put the Interaction ms to 600-900ms and sometimes it just flies into the nodes without looting anything , gets stuck somewhere like it tries to fly through a roof when the saronite is under that , and it flies into huge mob groups which cannot be killed properly as a hunter. Moreover the profile leads through some saronite that is placed within groups of elites. Can you maybe help me to get this to work properly? Edit , Thanks for the answer , but I play a hunter which is hard to bot with since there is no moving to get range. Moreover I experienced this issue that wrobot and not your route has , but atleast it would be better if you could blacklist the elite groups and maybe fly more precisely to prevent wrobot from flying at the orb and slipping down missing it completely. Thanks for the answer dude! That's some fair criticism I suppose. I have the default settings with Ignore Indoor Nodes ticked on and it's fine. I dont really have any collision on my end with objects such as mountains or w.e either but that could be because I'm using the SmoothMove Plugin. I dont really have a fix for the sometimes landing too far away and not actually getting the node because that's a problem with the gatherer bot itself and not with this path. As for the elites I can put out one that ignores elite camps, my characters are all 80 and can kill them though so it isnt a problem for me lol.